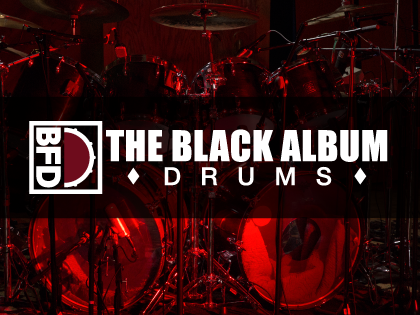 BFD Black Album Drums is an expansion pack for BFD3 inspired by the drum sound featured on the 1991 "Black Album" by Metallica. Produced and recorded by Chocolate Audio (the team behind Imperial and Modern Retro) and featuring the exact same 1980 Gretsch kit that was played on the album along with Zildjian cymbals, a Tama Bell Brass snare and a Ludwig snare. This pack captures one of the signature sounds in the history of Rock music. Chocolate Audio approached this production with enormous respect and love for the album. 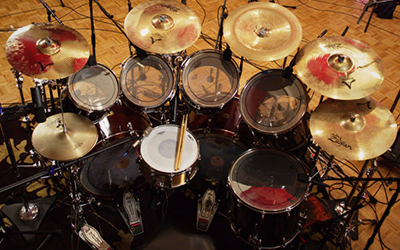 Everything from the original recording sessions has been reproduced as accurately as possible - including sourcing the original 1980 Gretsch kit used by Metallica for the album. Chocolate Audio also enlisted the help of Mike Tacci, assistant engineer on the Black Album and recorded the pack in the restored One On One Recording Studio (now 17 Hertz) where the original Black Album drums were recorded. The original recording featured an amazing recording setup and mics which the team aspired to recreate: Kicks were recorded with EV RE20, Sennheiser MD421 and a Neumann Fet-47 on the outside. Snares featured a Neumann KM-86 and a Shure SM-57 on top with an AKG C451 on the bottom. The Hi-Hat is presented miked with a Shure SM-7 and an AKG C451 and all other Cymbals are close-miked with AKG C451s. The Toms are top and bottom miked with Sennheiser MD409s and MD421s. Overheads were high hanging Neumann U87s and the Rooms feature a single AKG C414 as a mono rear room mic, 2+2 AKG C414 in XY on the left and right front of the kit, mixed down to stereo, 2 AKG C12s tube mics as front close rooms, focused on the drums (and especially the kick) and a couple of extremely coveted Telefunken ELAM 251E tube mics placed up above the original mic locker acting as far rooms.